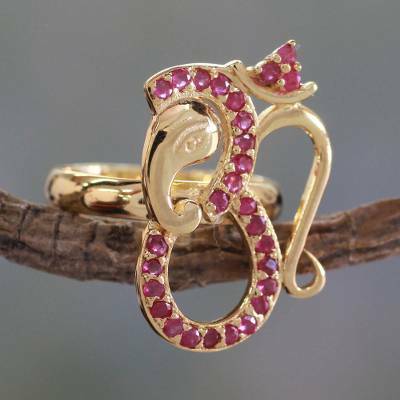 Ruby and Gold Vermeil Ring, "Ganesha's Om"
Rubies follow the path of Om within Ganesha's golden profile in the surreal design of this ring. One of the most beloved deities of the Hindu Parthenon, Ganesha is known as the Lord of Knowledge and Destroyer of Obstacles. Om is a sacred Sanskrit intonation repeated thrice at the beginning and at the end of Hindu prayers or reading of the Vedas. From Mahavir, the ring is crafted in vermeil of 18k gold over sterling silver. Bo-Ho Exotic Gold Vermeil Ring July Birthstone July Birthstone Rings Lovely Handmade Gold Ring Pretty July Jewelry Rich Gold Vermeil Ring So July! Wow! Striking!